"Every girl wants to feel like a princess on her wedding day. You made that dream of mine come alive, and please know that I will be forever grateful. As I've told you probably 20 times, I never wear makeup. So the thought of wearing a full face of everything from foundation to lashes on my wedding day was nerve wracking at first. But after my first trial with you, I knew I had NOTHING to be worried about. You made me look like myself, but just a more glamorous version of myself. I loved my trial so much that I knew I needed to have you to my makeup for my bridal shower. Do you know how many compliments I received at my shower, and how many people told me I was crazy if I didn't recreate that look on my wedding day? And then on the most hot, humid and disgusting day of October, you came to my house at 7:30 with a smile on your face, ready to pamper myself, my 5 bridesmaids and my mom. Not only was your work gorgeous, but you were a bubbly, fun energy to have in the room while I prepared to marry the love of my life. I'm not exaggerating when I tell you that my makeup lasted all day long. Through the humidity, the sweaty night of dancing, and million kissing pictures that I took with my husband, I still looked an felt like a princess. I'm sad as I write this, knowing that know I won't have many more excuses to have you do my makeup. But I promise you that if ever I get the opportunity to get made up and feel like a princess again, you will be the first person I call. You are an amazing person with an amazing talent, and I am honored to have been one of your brides! Love, Megan"
"What more can I say..Ashley is incredible! I came across Ashley at a bridal show pretty much after I selected all of my vendors, including a potential makeup artist. I quickly looked through her portfolio and was extremely impressed. Luckily, Ashley lives right around the corner from me and I set up a trial. Right there I decided to hire her. It was the best decision I made. She helped me feel and look beautiful on the most important day of my life. She enhanced my bridesmaids beauty as well. We all received compliment after compliment on our makeup..Who did your makeup????? That’s simple ..Ashley Landry..a naturally talented makeup artist who I would recommend to any future bride :)"
"Where to even start. Living in a different state and planning a wedding is crazy, but Ashley made it that much easier! For my trial She made sure she was available...then for my wedding day she made all my bridesmaids the definition of perfection. I had so many compliments on my makeup!! Everyone said I looked like a princess. I felt like one too! She applied makeup to 13 people that day, and yet every single one was beautiful! She does such a great job and is so personable & sweet." 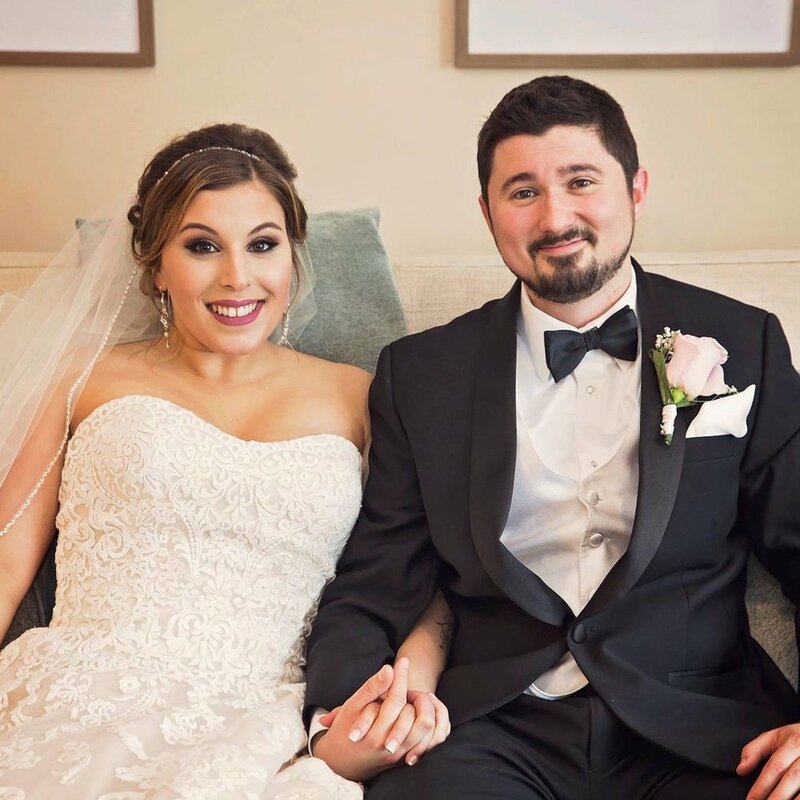 "Ashley did an AMAZING job on my wedding makeup! Leading up to my wedding I met with Ashley a few times to do some trial looks. We got to play around with different ideas and looks and had a really great time. This made me feel really comfortable with her. She is so friendly and easy to deal with. I never felt bad telling her what I liked or didn’t like. That was super important to me. The day of my wedding my makeup was FLAWLESS and exactly how I wanted it. I cannot even tell you how many complements I got! My makeup looked perfect at 3PM and at 11PM. It stayed on all night and continued to look flawless into the night. I would definitely recommend Ashley to do your makeup...she is wonderful and you will not regret it!! I wish I could use her everyday! "Hire Ashley. It’s as simple as that. Hiring Ashley for my wedding day was easily one of my best decisions in the planning process. Ashley is professional and easy to communicate with. She is sure to keep you updated throughout the process and even provides a timeline from the very beginning so I knew what to expect from her. Ashley is very personable, I had three sessions with Ashley and they weren’t awkward at all. Ashley keeps the conversation going and makes you feel comfortable. Her prices are absolutely reasonable for the quality that she does. Ashley is trustworthy and reliable. We got so many compliments on our Makeup. I am so thankful to have found Ashley and will recommend her to everyone! "Ashley is nothing short of amazing. Not only is she incredibly talented and professional, but she is an absolute joy to spend time with during what will no doubt be one of the most stressful times in your life. I am very particular with my makeup, and Ashley was incredibly patient with me throughout all of my nitpicking during my two trials. The results speak for themselves- my bridal party looked stunning and I looked exactly how I always pictured I would. Ashley, thank you so much for everything!!! "I couldn't have picked a better makeup artist for my wedding! Ashley was incredible, kind, and she did my makeup better then I could ever imagine. Not only was I extremely satisfied, but so was my entire wedding party. Everyone looked stunning. If I could do it over again I wouldn't change a thing <3 I would recommend Ashley to every single bride!" "Ashley Landry is THE best makeup artist around. First of all, she is one of the most professional vendors I dealt with during mt wedding planning. She reached out to me throughout the course of my wedding planning to check in and was always prompt in responding to my (sometimes frantic) emails and texts and was always flexible when there was a change in plans (which there was multiple times). And I can't even put into words how TALENTED she is. I have never seen my bridesmaids look more beautiful. Some of my girls rarely wear makeup and were scared to get their makeup done; however, Ashley did everyone's makeup within their comfort zone and the results were BEYOND all of our expectations. All 4 of us were shocked and in love with eachother's makeup-and our own!! Thank you Ashley for making me and my bridesmaids feel beautiful and confident for my wedding day. You are the Best!" "Ashley is absolutely amazing at what she does. I felt so beautiful on my wedding day. She is so talented everyone commented on how beautiful my makeup looked. Aside from how amazing she is at makeup she has such a great personality. She is so kind hearted, and bubbly. Very easy to be around, she was just like another one of the girls as we got ready. I would recommend Ashley to do your makeup for any event, but especially your wedding. I know if I have another big event I will definitely be calling her. "How do you even begin to describe 'Perfection' without being a gross understatement of the service that Ashley has provided to myself, my mother, mother-in-law, sister and my most important ladies on the day of my wedding! She was always so helpful, prompt and willing to answer any and all questions that we all had for process. When she did my makeup trial for the day of my bridal shower I joked with Ashley telling her she "Needed to use glue on my face to avoid the inevitable happy tears that were to come that day.." of course I didn't need to worry. I had so many compliments at my shower all of my guests commented on how perfect it was despite my happy tears throughout the event. I knew that my makeup would last the entire day/night of my wedding. As I knew she would, she brought her A-game her service was absolutely AMAZING I didn't have a worry in the world while she worked on me and was so beyond satisfied with the results. I cannot say enough good things about Ashley Landry and her makeup service, she is the Real Deal! I so look forward to the next event I can get my makeup done by Ashley. I highly recommend her to any and all soon-to-be Brides that want to feel like a QUEEN on the day of their wedding! Call Ashley she will NOT disappoint you!! "After having a few makeup trials before my wedding and not being completely happy with any of them, I was referred to Ashley by a friend. I am so happy I reached out to her because my makeup as well as all of my bridesmaids makeup was PERFECT!! I definitely recommend Ashley to anyone who is looking to have their makeup done. Not only is she sweet, she is so talented! "Ashley is not only an amazing make-up artist, but one of the sweetest people you will ever meet! She is professional and accommodating! Leading up to the day of my wedding, I was nervous about being able to get makeup for 9 people done in 6 hours, but Ashley reassured me and delivered on the day of my wedding. All 9 of us looked absolutely beautiful, and we never felt rushed. Ashley was made me feel relaxed and confident that everything would go smoothly on our big day. She even stayed in a hotel nearby the night before to calm my nerves about her having to travel a long distance on the morning of the wedding. I am so glad that I decided to call Ashley. Working with her felt like working with an old friend, and I'd highly recommend her to anyone looking for the best! Not only did I feel beautiful, but I looked naturally and my makeup lasted the WHOLE DAY!!!! Thank you so much to Ashley for helping to make my day perfect! "I was just beginning to search for makeup artists when at a food tasting event another bride recommended Ashley to me. I looked up her social media accounts and was visually impressed. The price range was fair for the work and it included false eyelashes. I reached out to Ashley and she was very kind, so I scheduled a makeup trial at her home for the day of my bridal shower. I brought a photo with me but honestly, the way she did my makeup was even better! I received many compliments on my makeup the day of my bridal shower. The makeup lasted all day and my shower was in August! Needless to say, I booked Ashley for my wedding day to my makeup, aunt's and my 5 bridesmaids makeup. Ashley traveled to my home and arrived on time, set up her makeup and worked so incredibly hard to have all of our makeup done in the requested time frame. She was very personable and calm. We all enjoyed her company as she listened to our requests and worked on our makeup. By the way, she is very, very gentle while putting on makeup! This is the first review I am writing for a vendor because I have nothing negative to say about this makeup artist. I just received some photographs back and not surprising, my makeup and bridesmaids' makeup looks flawless in the photos! I highly recommend Ashley Landry as a makeup artist for future brides. "Seriously THE BEST! I am extremely picky when it comes to makeup because I never wear it, so I didn’t know what I liked or didn’t like, all I knew was that I wanted a natural look. Something light and soft yet noticeable enough for pictures on my wedding day. And Ashley did just that! She listened, was patient with me, understood what I wanted and was so kind about everything. I even booked her for a few occasions I had after my trial with her. I always left feeling beautiful and my makeup always lasted the entire day sweating or not. She’s the best and I highly recommend her and will continue to use her for any special occasions I have!! Thank you so so much Ashley!! "I want to feel beautiful...“ those were the words I spoke to Ashley when I reached out to her to do my makeup for what was the biggest day of my entire life. I sent her so many picture ideas of what I thought might look nice and she helped me narrow it down and told me what would look beautiful with my color scheme. She left me with a ton of options so I never felt forced into anything. With what little I gave her direction wise our trial run ended up being a blast. Ashley made me feel comfortable the second she walked into my home and she was nothing but kind and friendly from the start. Ashley is a professional through and through she showed up bright and early as per my request and never once complained. She handled herself amazingly the day of with all the chaos going on around her. She was great with time management and keeping me calm while sitting in the makeup chair. I finally had a chance to breathe and actually enjoy the process Ashley was truly a breath of fresh air. My bridal party and I never felt rushed and she even stuck around until just before the ceremony to ensure that I looked beautiful throughout the event. The makeup she uses is all top quality and well known and liked brands that will be sure to last through a scorcher of a day (my outdoor wedding had heat, humidity, and even rain!!) and yet my makeup stayed flawless throughout. If you are looking to leave your husband at a loss for words when he sees you don’t look any further. I promise you will be in great hands with Ashley. "I cannot say enough about Ashley. She was amazing to work with for my wedding. My makeup was amazing as well as my bridal party and in laws! I continue to receive compliments on my makeup. She knows the perfect combo of the natural with a splash of wow to make your makeup perfect! My husband absolutely loved the way I looked on our wedding day! Ashley is amazing to work with before and on the day of wedding. Even when I was unsure of what I wanted she knew exactly what to do to make the makeup perfect! I would highly recommend Ashley for any special events you are attending and would 110% use her again in the future! Book Ashley, you will not regret it! "What can I say about this beautiful talented lady?! She's amazing!!! When I first met Ashley at my wedding trial, she was super friendly and sweet! Her makeup is perfection. I had never had my makeup done professionally so I didn't know what to expect. When I first saw myself when my makeup was done during the trail, I was shocked how beautiful I looked. She knows how to enhance your beauty with make up and not cover your face with it. On my wedding day, it was no different. She made me and my maid of honor took stunning. (Thank you for traveling to my side of Jersey Ashley!!!) I would highly recommend her for any one who's looking for a makeup artist for any occasion!! XOXOXO"